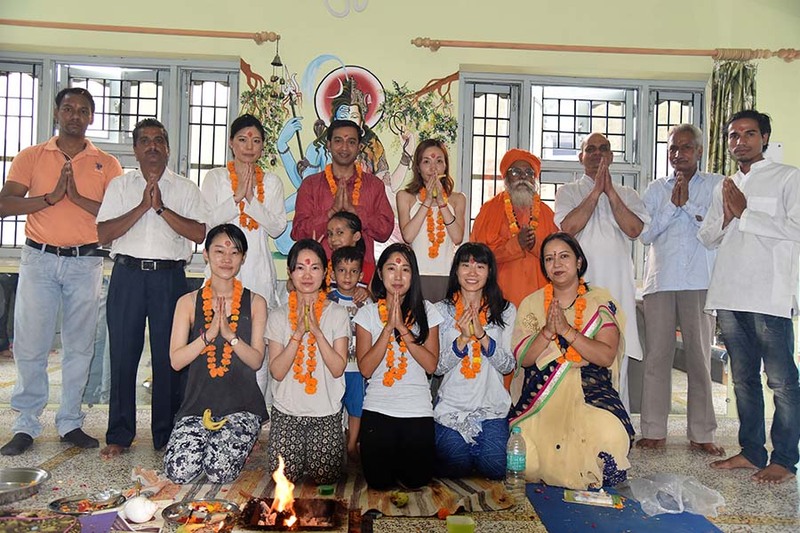 We invite and welcome yoga seekers from all over the world to come to Rishikesh India to experience pure authentic yoga in our yoga center and to explore your potential to be a certified yoga teacher (RYT) in near future. Our courses not only provide you an internationally recognized certification but also laid down a strong foundation of yogic insights. Our aim with this course is to plant potent seeds of spirituality and divinity within individual self that we hope it will grow by time and with your dedicated practice and attitude. Our yoga center teaching faculty comprises of experienced yoga teachers who are firmly rooted in tradition yet contemporary in their vision. We conduct regular beginner’s yoga course in Rishikesh India. It is an intensive course for beginner students. Duration of the course is one week. 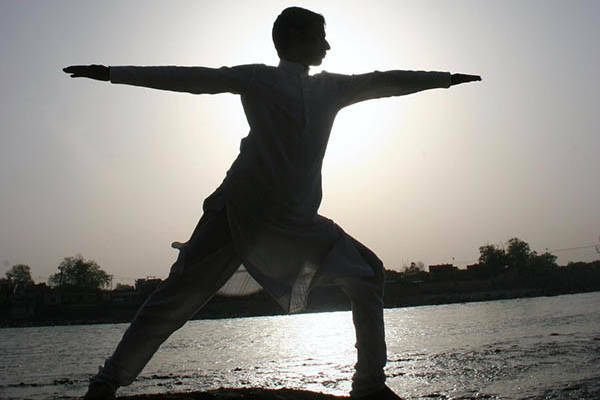 Under experienced yoga masters, you will be able to learn various yoga asana in the safe and effective way. Besides asana practices, you will be also introduced to various other yoga practices such as meditation for a beginner, Pranayama, recitation of mantra and yogic cleansing practices of hatha yoga in safe and effective manner. This course will satisfy your search for yoga and meditation in India. 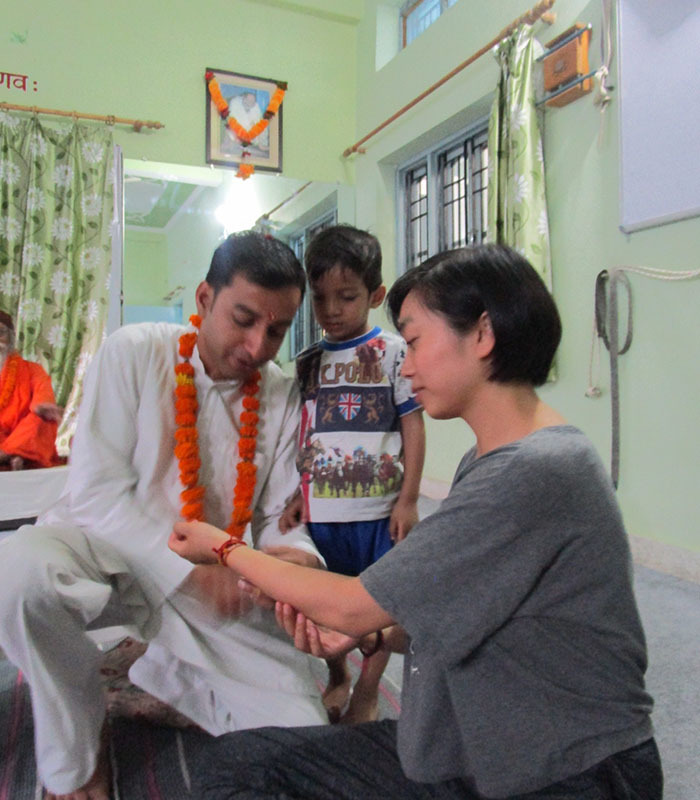 We conduct one week long yoga and meditation retreat in Rishikesh India. Come and join us to rejuvenate your body and mind. Yoga and meditation retreats provide you time and chance to listen to yourself and to reestablish your connection with yourself. Yoga and its related practices help to restore your physical, psychological and emotional imbalances which may occur due to daily hectic schedule or busy lifestyle. Yogic detoxification process (cleansing) various body postures-asanas, breathing regulation techniques -, pranayama, Concentration and meditation techniques and mantra chanting to address and heal participants at physical, mental, emotional and spiritual level. 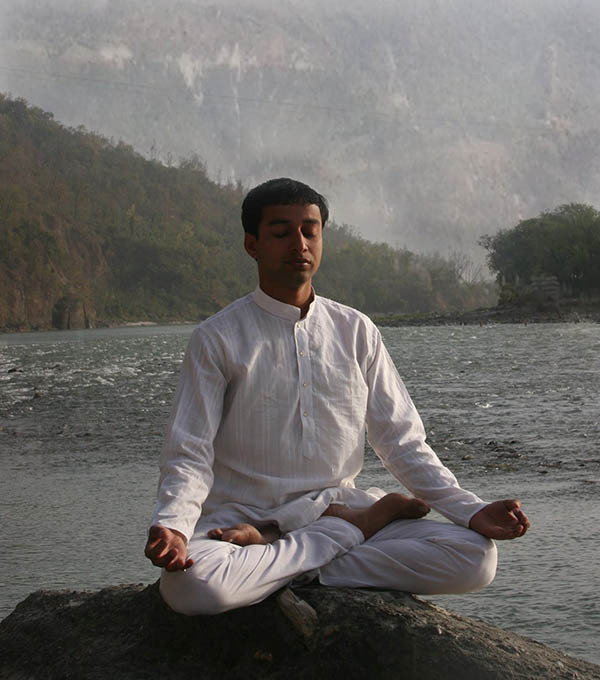 Rishikesh is an ideal place to plan your yoga holidays. From ancient time It had been one of the favorite yoga and meditation destination among Indian and overseas yoga seekers. Due to the presence of various saints and monks, it is regarded as a holy city. 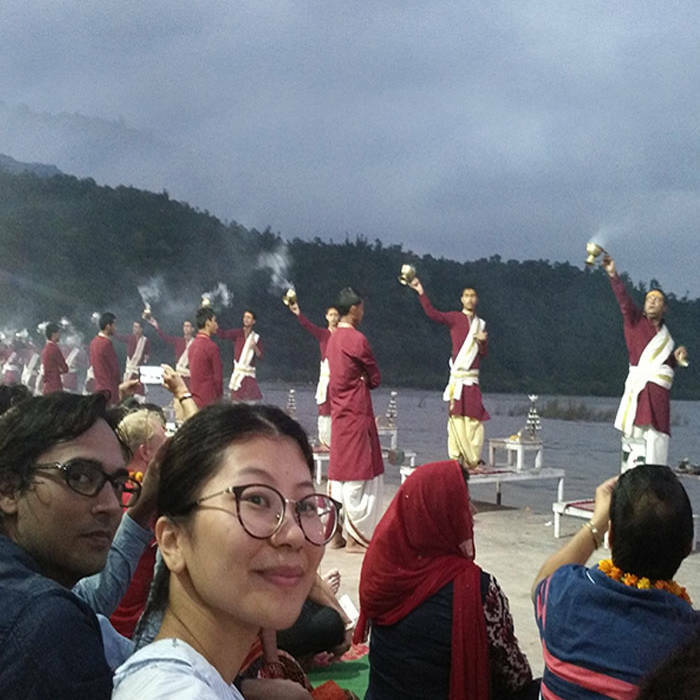 Holy river Ganga flows through Rishikesh and several ashrams and temples are located on the bank of holy river Ganga Presence of glorious great river Ganga, saints and monks and a spectacular view of jungle-clad hills and peaceful environment makes it unique yoga destination. It is an ideal place to learn and practice yoga and meditation. 200-hour yoga teacher training course in Rishikesh India can have a profound impact on your life in many ways you might never have imagined. A quality yoga teacher training course in India will boost your overall health conditions, greatly influence your approach towards life and deepening your understanding of roots of yoga and its various practices. Yoga is not something we can separate into various categories or number of hours training, yes of course for the learning point of we can group yoga into the various level. Ultimately yoga is one and it works in all aspect of our lives and with this course, our aim is to provide you pure authentic yoga and give you taste of the sweetness of yoga already present in you. How to teach a wide range of mixed abilities and ranges of capacities through various modifications and props. Two days (SUNDAYS ) for shopping in rishikesh market yourself. Registration fee is non-refundable, so please be sure of your participation. The date of commencement of program is the day of arrival at the venue. The course starts the afternoon (4.00 pm) of the first date listed and ends with lunch on the last date. The entire program will be taught by experienced faculty members in English. 200 USD per person is required as a Registration fee non-refundable (however can be transferred to the next course during the year) at least six weeks before from the date of course begins and balance student shall pay at the center on arrival day. Yoga is very useful and effective daily activity. It melts our rigidness, increases our range of motion, and releases us from physical and psychological burdens. This course offers you some effective tools and techniques to experience above mention benefits of yoga and to find your inner strength and guidance to experience pure yoga within yourself. This course syllabus covers some basic fundament principles of yoga and meditation practices thought and practices by great yogis in India.This course is beneficial for beginner’s students as well as experienced yoga practitioners. We believe each individual person have potential to practice yoga and explore his/her potential. This course can be your first step to experience and explore pure and authentic yoga in Rishikesh, India. As a new student of yoga, you may have some questions /doubts, concern about your certain body limitations or what to expect from this course we are open to hear from you and assist you to work with you on such issues. We provide safe and effective yogic environment to make your yoga experience more pleasant and memorable. We strongly believe every individual have potential to practice yoga and get its benefits to improve quality of their life. There are numerous reasons to join yoga classes and courses which include physical fitness, mental peace, stress management, yogic healing or spiritual awakening. There are so many benefits of yoga. Whether the purpose is modest or ambitious, the proper practice under expert guidance brings desirable results at physical level, psychological and emotional level and this can transform your life. . This Beginners yoga course is designed in such a way that it suits to requirements of a beginners students as well as regular practicners, it shows you couplet picture of yoga guide you how to practice yoga safe and effectively and minimizing chances of getting yoga injuries , how to overcome obstacles and challenges in the path of yoga . Understand fundamental principal of yoga practice for safe and effective practice. Understand roots of yoga philosophy and spirituality. Improve your personal practices and body tone and flexibility. Elimination of toxins with the help of yoga asana, pranayama and kerya. We strongly believes yoga is for everyone and everyone have potential to reconnect his/her self. This yoga course for beginner is suitable for people. People who want to learn and practice yoga under the guidance of an experienced teacher. People who want to practice and learn yoga in a safe and secure, non competitive environment. People who want to live a balanced and joyful healthy life. People who wants to know and practice yoga techniques for stress relief and pain management. People who wants to learn and explore philosophical aspect of yoga which can give them a new prospective of yoga and life. As new students of yoga keep in your mind that yoga is not all about achieving perfection in your pose it all about being your best self. Yoga is a science and process oriented practice that offers holistic health benefits to everyone. Irrespective of your age, gender or level of practice. This course will help you to understand the basics of yoga and cultivate right mind set towards yoga and its related practices. This is important to learn yoga under supervision of an expert to avoid any yoga injuries. This course will help you to understand yoga more than physical practice because during this course you will be introduced to yoga philosophy, manta and meditation practices. And if you are spiritual person or looking for some spiritual orientation, through our yoga teacher training you may come away a deeper connection to yourself. Benefits Relief from illness improves flexibility strength, balance and endurance. Improves concentration and sharpens intellect. Develop spirituality and inner awareness and gift of being still which. guide us for peace and harmony. Single occupancy accommodation with hot shower and wi fi facility. 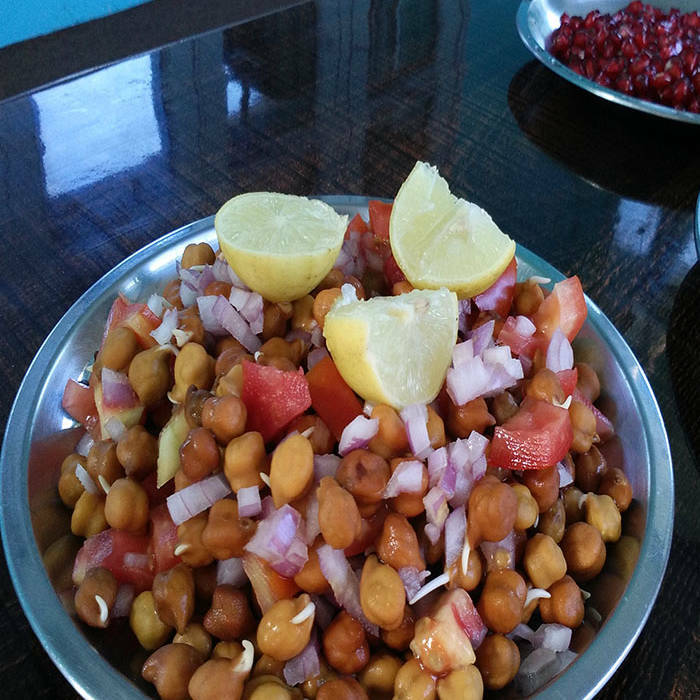 Three Indian vegetarian meal per day. One Ayurvedic complementary massage 50 minutes. Visiting Ganga aarti /temple visit. 100 USD per person is required as a Registration fee non-refundable (however can be transferred to the next course during the year) at least six weeks before from the date of course begins and balance student shall pay at the center on arrival day. (1) ASANA:-In this practical session yoga participates will study in detail about various hatha yoga postures. And how to practice with modification and adjustment to maximize Benefits of yoga. Proper use of Sanskrit names of asana, detail explanation of asana to understand their physical, psychological and spiritual benefits as well as their Contraindications for effective practice. (2) Pranayama:- In this breathing regulation session yoga participants will study various pranayama as mention in hatha yoga pradepika. With scientific approach. How to use pranayama safe and secure way to maximize its health benefits as well as certain contraindications required to be keep in mind while practicing pranayama. (3) Philosophy session:- Yoga is a practical science to unwind our spiritual energies. Without proper support of yogic philosophy its merely a physical exercise to satisfy our physical needs. 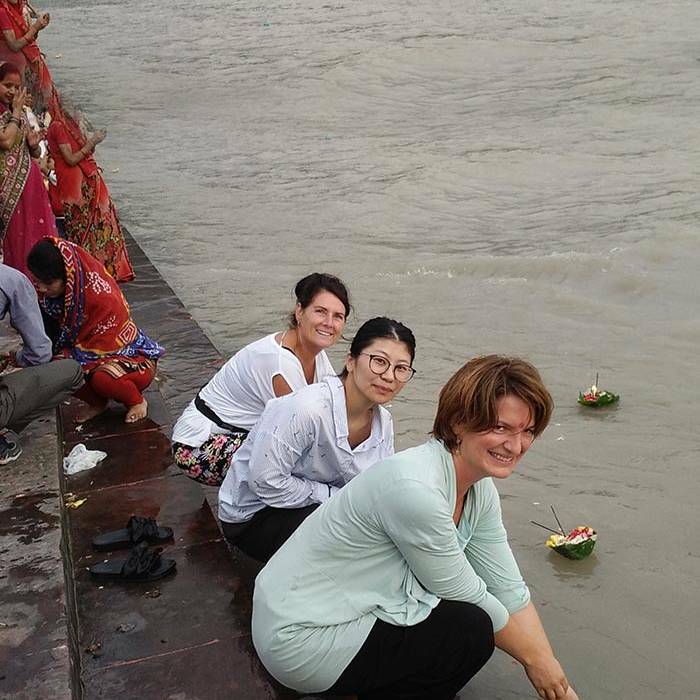 During this beginners course in Rishikesh India, Participants will study following topics. Meaning, definitions of yoga as per various ancient scriptures goal and objectives of yoga, various branches of yoga, etc. An introduction of patanjali yoga sutra and hatha yoga pradepika:-These are two ancient scriptures and authentic source of yoga. During this course participant will study various topics in interactive way. (5) Meditation Sessions:- It is one of the biggest challenge we face as a yoga practitioner that how to withdraw the senses from external world and divert them towards internal world and peace. During this course our expert we will share various tools and practices prescribed in ancient scriptures to limit modifications of mind stuff. This will help participants to understand meditation and to find suitable meditation practice for them. Practices will include. (6) Mantra Sessions:- Mantra is the special arrangements of Sanskrit alphabet when pronounced clearly produces a Special kind of sounds/energy. These sounds called as mantra. It may have meaning or may not have any meaning. By continuous recitations of that sound creates certain kind if energy field around us Mantra can be a tool for healing and protection in our life. In many spiritual traditions manta chants are used to concentration and meditation.in mantra chant session we guide student step by step to pronounce various Sanskrit mantra correctly and also their meaning and purpose. Plan your holidays in Rishikesh India, renowned as world capital of yoga for learning yoga & exploring rich Indian culture heritage. Join our yoga and meditation retreat to explore and experience pure yoga and meditation with experienced Indian yoga masters. This yoga and meditation retreat is being run jointly along with the participants of yoga teacher training course. Location of yoga retreat center is Rishikesh, which is situated in the foot hills of Himalaya Mountain and on the bank of Divine River Ganga. Himalaya and Ganga both have been remain center of attraction for many yogis, sages and spiritual seekers around the word, intact Himalaya is home of various enlightenment sages and yogis from ages. This retreat is designed to help you relax, refresh and experience pure yoga. No matter whether you are beginner student of yoga or a practitioner, the retreat help you to understand and learn easy and effective way to practice yoga and meditation with its philosophical background. This retreat provide you various tools and techniques to find appropriate solutions to managing day to day stress , release emotional blockages, increased energy and fitness level, as well as restoring your balance and connectivity . We provide you effective tools and methodology, knowledge, motivation and helpful study material and recourses to continue yourself practice and exploration. People are interested in joining yoga and meditation retreats in India for various purposes. It can be related to their health concerns such as flexibility /fitness or stress-related concerns such as anxiety/depression or emotional imbalance/ instability. It can happen due to various internal and external factors. Whatever is your purpose of joining this yoga and meditation retreat the correct practice with right mindset brings greater fitness level, incomparable peace, and happiness which can transform your life. Yoga and meditation practices have great power to heal and bring vitality and good health to yoga seekers. The aim and objective of this yoga and meditation retreat are to restore the health and happiness to its participants through various tools and techniques of yoga and meditation as well as to let them experience inner peace and joy fullness. Generally. To understand the fundamental principle of yoga and meditation practices. To understand the significance of yogic philosophy, in learning and practicing yoga and meditation. To improve your personal practices body concentration, flexibility and endurance capabilities. To be able to detoxify your body with the help of yoga asana, pranayama, and yogic cleansing process as described in ancient text. How to recite mantra properly and what is science of manta in healing and meditation. Students want to study yoga, meditation and Indian philosophy under guidance of experienced teacher. 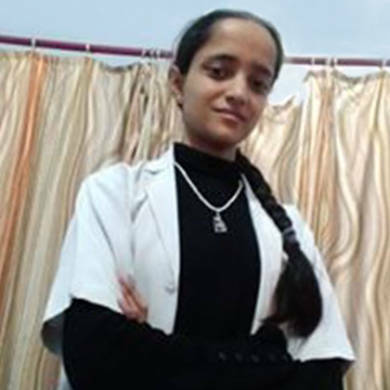 Students want to include principle of yoga and Ayurveda in their daily routine. Yoga and meditation play significant role in the health of our body and mind, Yoga and meditation helps is finding peace of mind and total control over body. Some proven studies have shown that yoga and meditation have positive biochemical effects on human body for the management of stress, depression and anxiety. Stress, anxiety, nervousness are the results of our endocrine hormonal system which can be balanced with the help of yoga and meditation. Some benefits of yoga and meditation are as follows. Cultivate positive approach towards life. 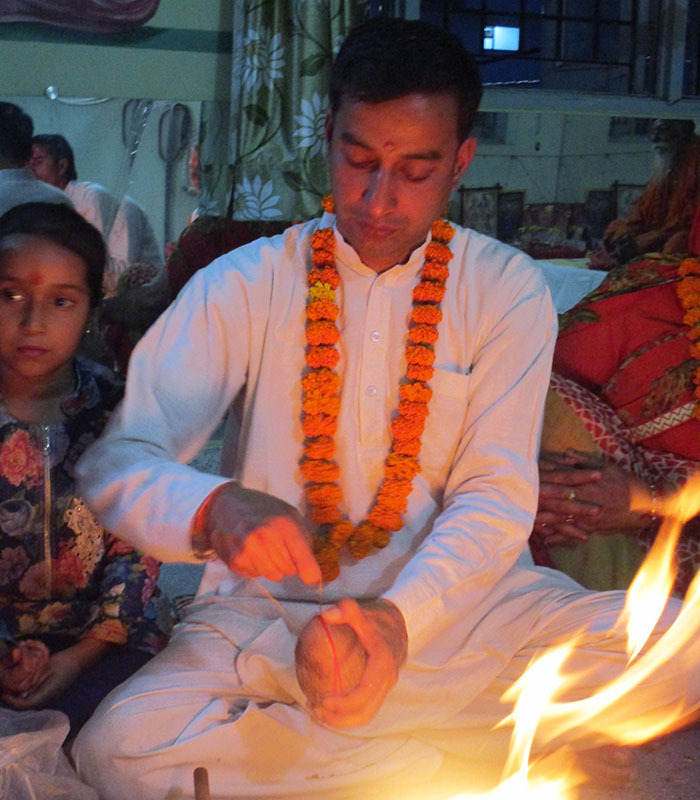 Visiting Ganga aarti /temple visit /meditation cave visit. The date of commencement of program is the day of arrival at the venue. The retreat starts the afternoon (4.00 pm) of the first date listed and ends with lunch on the last date. 10O USD per person is required as a Registration fee non-refundable (however can be transferred to the next course during the year) at least six weeks before from the date of course begins and balance student shall pay at the justify on arrival day. Before paying the registration fee online kindly drop an email for booking /availability of seats. Some Good Reason To Practice Yoga With Us! 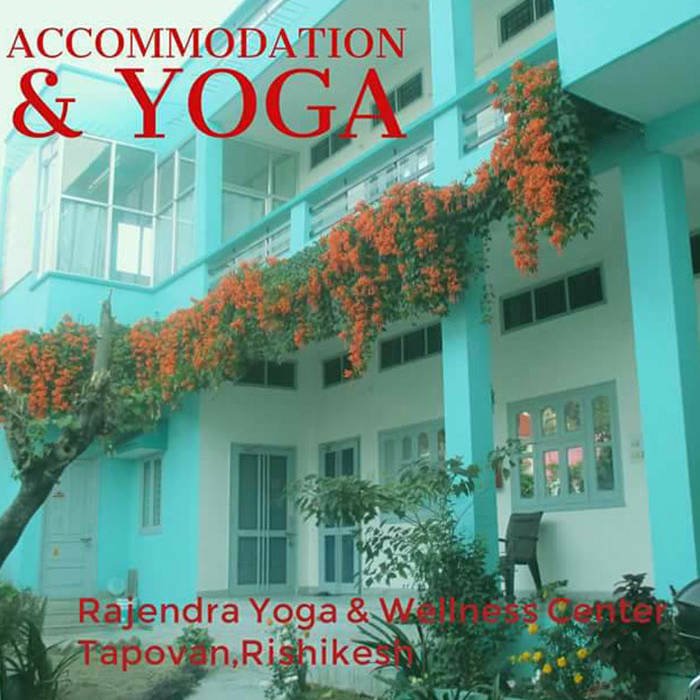 Our school is located in Tapovan (Rishikesh) which has ample of natural beauty and serenity to pursue yoga activities yet not far from the main city Rishikesh. 200 hour yoga teacher training in India by Yoga alliance certified school. 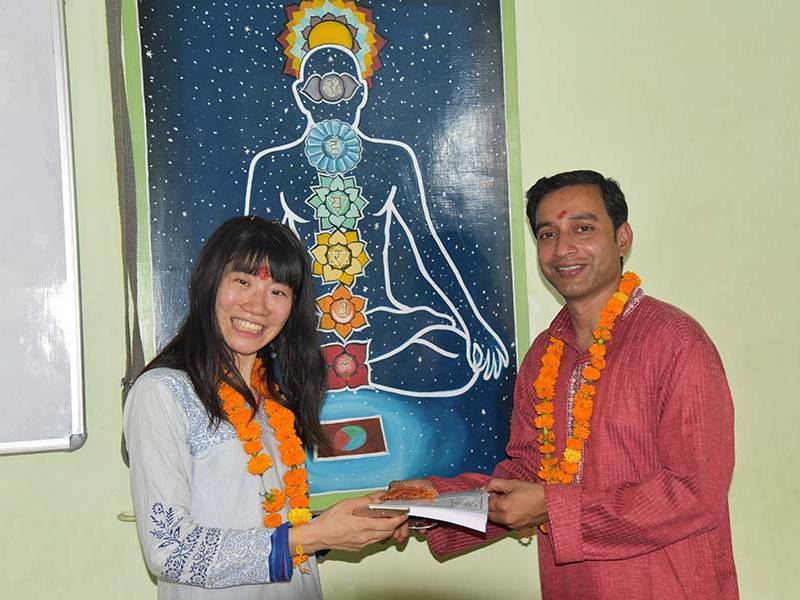 Yoga teacher training certification courses in Rishikesh by Rajedndra Yoga & Wellness Center. No refunds are available for cancellation prior to, during or after the start date of any yoga teacher training course. If you have any questions or if you need more details about pricing and payment, please don’t hesitate to contact us at info@yogmaster.org. Regular practice of yoga & meditation promotes muscles strength , flexibility & purity of body & mind. Yoga & meditation brings Psychological Immunity,helps in anxiety, depression & traumatic exprences. With regular yoga & meditation practice you can manage deep-rooted emotions such as anger, negativity etc. Spirituality is the essence of being human spiritual oriented yoga practice helps you to gain higher goals of life. To experience yoga as taught by Rajendra was for me an opportunity of great learning and personal growth. 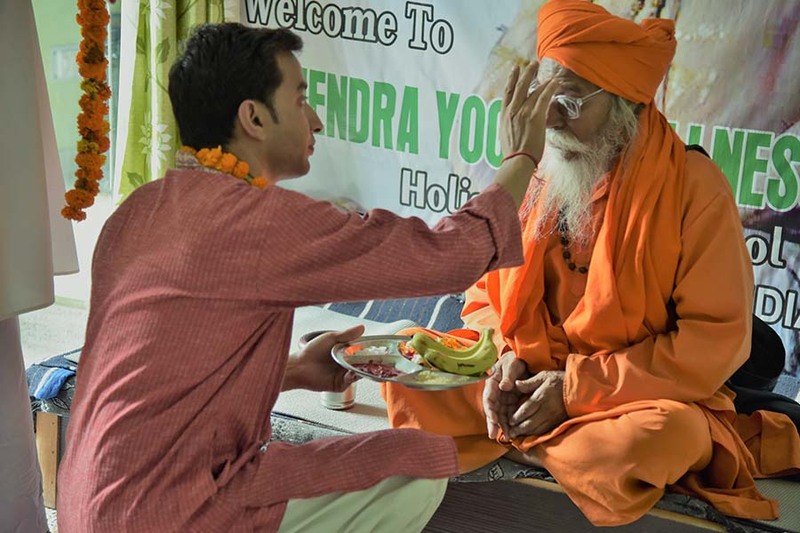 If you have the chance to stay at his center, by spending time with Rajendra and his team, you could be able to understand a little more about discipline, lifestyle and spirituality, as everything is taught keeping the Indian culture, tradition, and variations intact. Rajendra is very authentic in his method of teaching and in the way he behaves towards people around him. 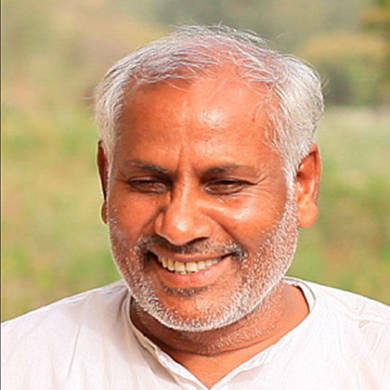 I am grateful to have found Rajendra as a yoga teacher in autumn 2017. I had a wonderful time here. 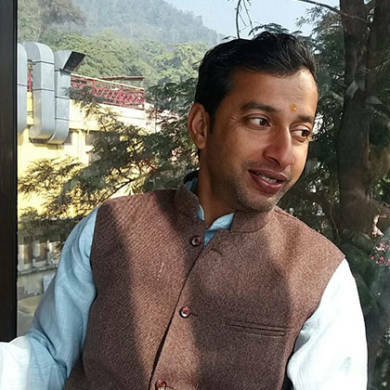 A teacher Rajendra is trustworthy, knowledgeable and modest. He teaches students according to their individual level, so I can recommend him to anyone from beginner to advanced. I have never expected I would get into yoga this much until I came here. Our rooms are well ventilated and big enough for a comfortable stay and self-practice. Each room has attached bathroom with hot and cold shower and wi-fi. 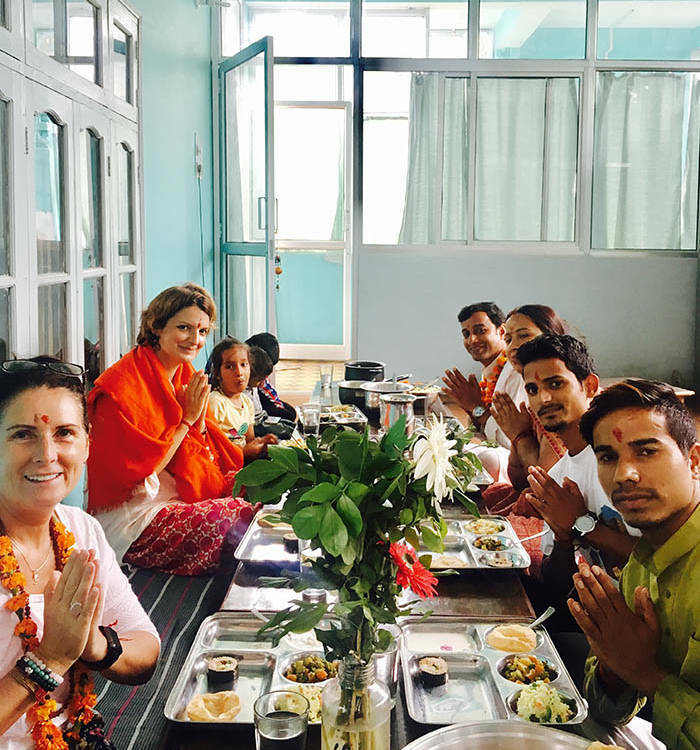 We believe accommodation & food greatly influence our mind and emotions, We provide decent hygienic room and taste, nutritious yogic food to our yoga students which help participants to start their yoga training with a positive mind. 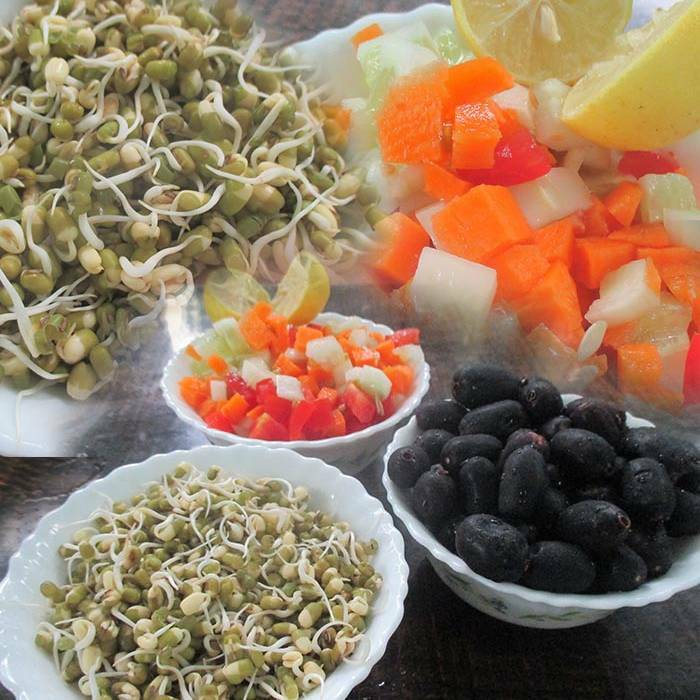 Our hygienic yogic food includes seasonal, local vegetables, fruits, grains and nuts which provides enough vitamins, carbohydrates, protein and other essentials nutrients. If you have some dietary concerns/ preferences/restrictions kindly contact us. We will be happy to help you. Often overseas students have concern and curiosity about the standards of accommodation, safety, and hygienic food facilities. We are committed to providing comfortable accommodation, hygienic food and safe environment to our valuable students. We except form yoga participants not to smoke in the room and take charge of their respective room –keep it clean and tidy in the spirit of karma yoga. Ask for cleaning material if required. Be ready to accept different climate, culture accommodation and food challenges and consider it as a part of their yoga training /sadhana. 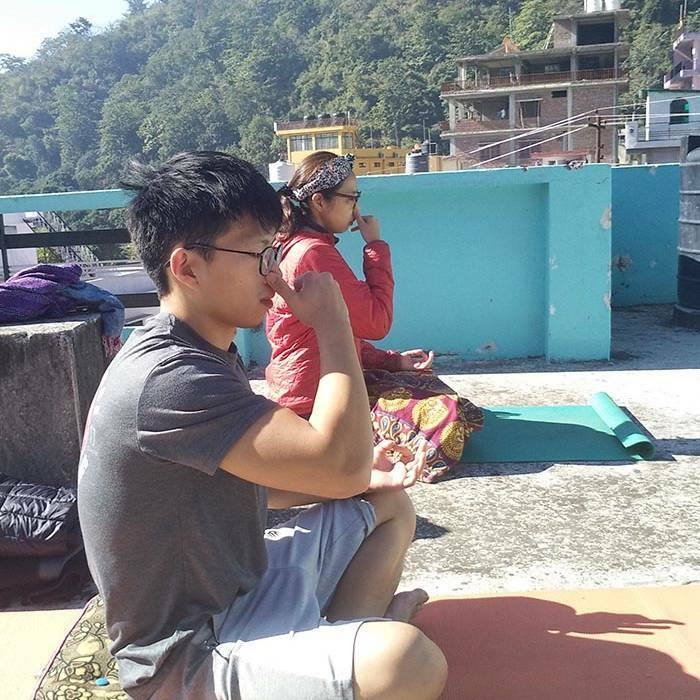 During our half day /full day yoga excursion, we learn a various aspect of yoga from various recourses and enrich our yoga skills far beyond physical postures. 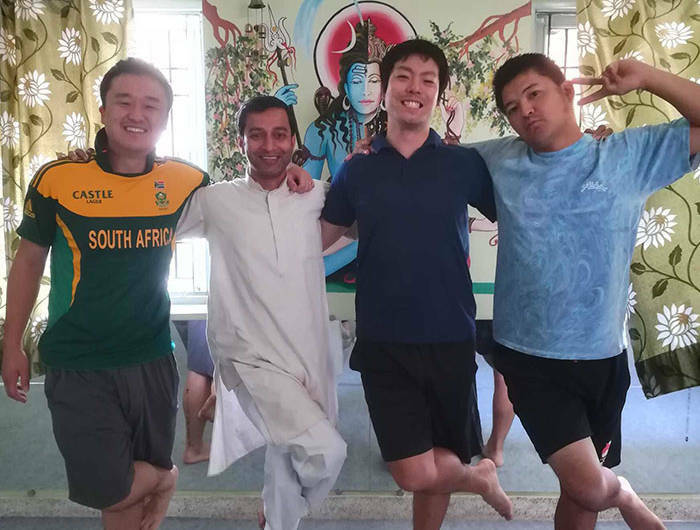 It gives us chance to explore yoga and spiritual diversity of various yoga lineage.This yoga excursion brings freshness and joyfulness among teachers and students and help them to know each other well. This is a great opportunity for yoga seekers to have firsthand experience to witness how beautifully yoga and cultural diversity intermingle in India.